The controversial Sri Lankan umpire Asoka de Silva has been dropped from officiating in some of the important World Cup fixtures.This decision by ICC came in the circumstance when he declared Ireland's batsman Gary Wilson lbw during the match against West Indies on Friday even though on reviewing the decision twice. Gary Wilson, who was batting on 61, reviewed the lbw decision originally given by Asoka de Silva, and on replays it showed that the ball had hit the pad outside off stump. Nevertheless, de Silva remained with his original decision even though after a second go at the decision. Ireland captain William Porterfield strongly criticised the decision in the post-match press conference and was reprimanded by the ICC. In the 2011 edition of World Cup amongst panel of 18 umpires Asoka de Silva's success has been the lowest , going lesser than 50%, so ICC made their decision in removing the Sri Lankan umpire. He was supposed to officiate as an on-field umpire for the match between England-West Indies and third umpire for India-West Indies game, de Silva will no more officiate the crucial ties. 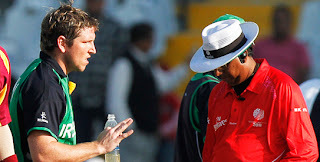 Instead he will officiate as fourth umpire in the Ireland vs Netherlands match on Friday, and will stand as an on-field umpire for the Zimbabwe-Kenya game on Sunday. ICC general manager, Dave Richardson said ICC did not want their best umpires to officiate in matches of lesser importance .